So the chance to meet this ancient tribe in their natural surroundings, on a weeklong yacht expedition with Burma Boating, is irresistible. The first fully solar-run yacht in Asia will set sail this month offering expedition around the Myeik Archipelago, the operating company Burma Boating said on Wednesday. One of the world’s last uncharted seas, Myanmar’s Mergui Archipelago comprises 800 islands, atolls, and coral reefs in the Andaman Sea off southern Burma. “Because of the monsoon season between May and October, the seas are rough—sailing is therefore restricted to a period of cool dry season between November 1 and April 30,” says Eric Poepper, operations director with Burma Boating. “This is a family-friendly cruise, but better for the intrepid traveler due to the mystique and lack of infrastructure.” Electricity and Internet at the port are variable, and, in general, Myanmar infrastructure is about 30 years behind that of neighboring Thailand. "MYANMAR, MEET SEA GYPSIES: There's only one way to visit Myanmar's Moken people. Just 2000 visitors a year will do so, aboard [Burma Boating] boats sailing to the remote Mergui Archipelago, a 400-kilometre-long strip of 800 islands off southern Myanmar. The Moken live off the sea on small boats, though many settle in villages on the archipelago's tiny islands. Sail from Kawthaung near the Thai border to observe their 4000-year-old hunter-gatherer ways." "The ocean here in the archipelago is pure magic and offers amazing sunsets on beaches where you are the first tourists. Watching the sea gypsies in their natural habitat is an authentic experience, and not yet a tourist attraction as you would find in Thailand. Myanmar really is a country that as everything." “A string of forgotten islands, the Mergui is one of those rare places that derives from an era when virgin lands were nothing but memories. In this world, which is only open to sailors, the last “sea gypsies" live. 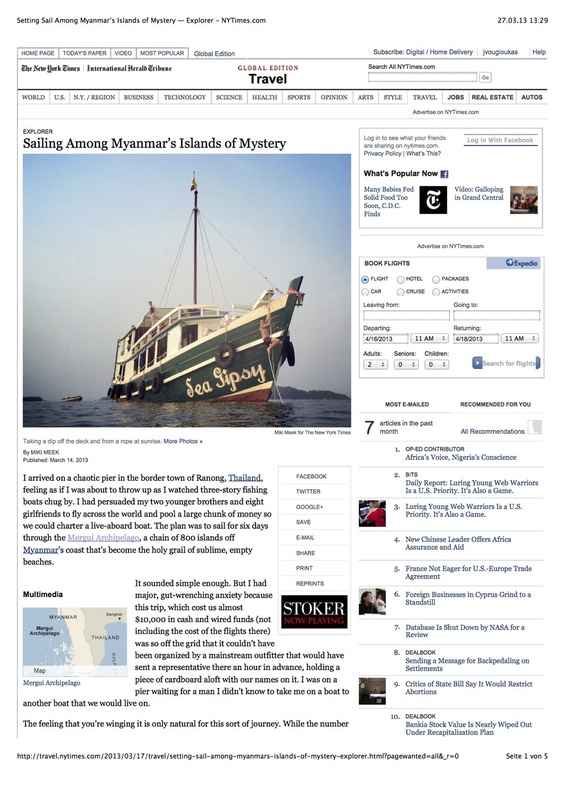 "The Mergui Archipelago is so remote, in fact, that there is no Wi-Fi and phone service on board. For me, this is one of the most magical aspects of the voyage. No e-mail or text messages and no alerts or phone calls. No one to check in with, no social media to scroll. We are completely disconnected from the rest of the world and the freedom of it is indescribably peaceful. It is as though, beyond our boat and our beach, no other world exists." "We are not alone at Kyun Phi Lar. There are two Moken boats anchored at one end of the beach, silhouetted in the afternoon sun. They see us too and before long a delegation—two youngish men and a girl with curly, sun-streaked hair—pulls up to our yacht in a dugout. The crew brings them eggs, rice, fish, water, and sweets (and later a bottle of rum and cigarettes), and they give us a special treat in return—two lobsters." "On the way back to the boat, we dropped in on a Moken family who had materialised in the bay. Their boat was festooned with ropes and awnings, baskets and nets, pots and laundry lines. Rows of fish were drying on the roof, a tangle of live lobsters were squirming on a lower deck and what appeared to be a squid was spread-eagled on the foredeck. Women and children scuttled about, cooking dinner, mending nets, bailing water, playing games; while in the stern a great pasha figure sat enthroned, shirtless and aloof as a Buddha. He smiled, granted us a regal wave and sold us half a dozen lobsters. Back on the Scame, we dined on the moonlit deck." "The Mergui Archipelago in south Myanmar is located right at the Thai border - but far away from the tourism hustle and bustle. The magical empty beaches can only be reached by boat. A luxury cruise into paradise." "Currently, foreign visitors to the archipelago must be part of a guided boat tour. Tours depart from Kawthaung pier at the southernmost tip of Myanmar near the Thailand border. For a small group (two to eight people) charter or private yacht cruise including airport transfers, lodging, and meals, sign on with Burma Boating. Tours can be customized to fit specific themes, such as a photography and video safari. They also accept credit cards, rare among archipelago boat tour operators." "The absence of tourists is largely attributable to Myanmar’s repressive government. Tourism numbers were for many years kept to a trickle, and foreign-owned businesses largely unheard of. However, over the past three years, the government has attempted to pull back the veil covering Asia’s last-frontier nation and introduce democratic and economic reforms." "We return to the Meta IV to find Aperol Spritz sundowners waiting for us and learn that the crew has caught more than a dozen fish with handlines over the side of the boat. After a delicious meal of steamed fish and fried squid (...). There is a consensus among the guests that no one has experienced a more memorable holiday. None of us wants it to end." "The star of the show is the William Fife schooner ‘Sunshine'." "It was a dreamy voyage that took us beyond internet connectivity, from green coastal waters to the kind of blue inked in by 100ft depths, past piratical-looking fishing boats and islands with the outlines of rusty blades. Scampering macaques foraged for crabs on the islands’ rocky shores, white-bellied sea eagles wheeled." "Among 800 pristine Burmese islands and the few thousand sea gypsies who call them home, Jeninne Lee-St. John sails off the grid and into a dream world of romantic legends. Just let her sleep a little while longer." "After two days of glorious sailing on an unruffled sea, we dropped anchor off a marine jewel – Myanmar’s only marine national park, Lampi, a place the Moken call 'Mother Island'. (...) The evergreen forests host nearly 200 plant species and within this green haven roam mouse deer, gibbons and macaques that amble down to the beaches to catch crabs (they have a menu of 42 species to choose from). There’s even one wild elephant, the lone survivor of a small herd that was transported to Lampi from the mainland." "Its borders were thrown open barely a year ago and already the madding crowds are thronging to Burma. Head down south, however, and you'll find a remote region of more than 800 islands whose white sands and crystal waters welcome fewer than 2,000 visitors a year. 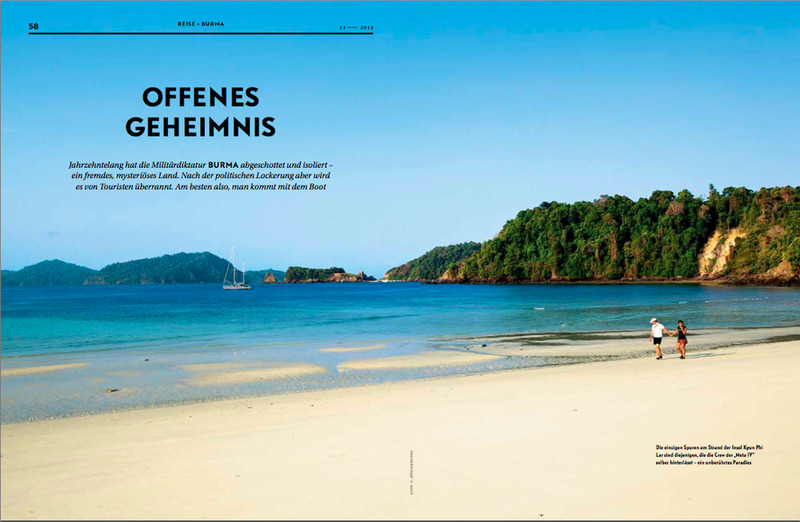 To describe the Mergui Archipelago as untouched is almost understating its sense of seclusion. But the smart set are slowly discovering its charms thanks to savvy charter outfits such as Burma Boating, which offers five-night itineraries aboard a classic two-masted yacht." "The rarely visited islands present white-sand beaches for sunbathing and starlight barbecues, diving, snorkelling and fishing, and a chance to meet and talk with the local sea nomads who sail the waters in dugout canoes." "Perhaps one of the few remaining places in the world still left almost completely untouched." 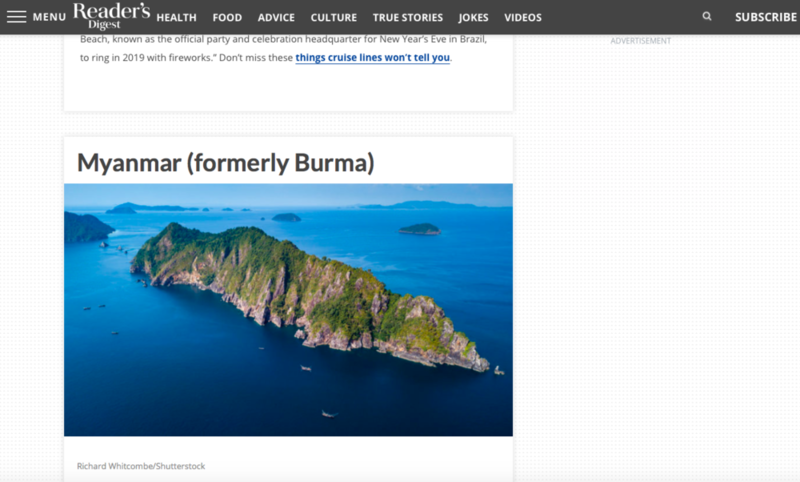 "Hardly anyone knows the Mergui Archipelago just off Myanmar's coast, and you wish it would stay that way. But how long can such a secret be kept?" "If you’re looking to hit a path less travelled, check out Myanmar sailing specialists Burma Boating, which organises trips to the region on board the 85ft luxury yacht Meta IV." "The 800 islands of the Mergui archipelago, off the coast of Myanmar, were off-limits to tourists until 1996 and remain little visited." "A yacht like a floating boutique hotel." "The view from the boat is always breathtaking. As we weave through the islands, we see strangler figs wrap their vines along the rocky edges of smaller atolls, forming patters not unlike the soft curves made by the waves below. Tall granite and limestone rocks jut out of the water like those at Railay beach that attract climbers from around the world." "As well as nosing around the islands, guests alight from the boat from time to time, going on jungle hikes, lazing on island beaches, swimming, fishing and taking canoes into mangroves. Which makes it sound remote. But as it turns out, the archipelago is relatively accessible, in a geographical sense. The best way to access it is to fly to Phuket in Thailand, do a short hop to the southern Burmese port of Kawthaung, then sail into the islands. It takes three to four hours from Phuket." "Immigration didn’t take long and after exploring the old town and stocking up on provisions at the bustling bazaar, we set sail for our cruising destination: the legendary Mergui Archipelago. The Mergui! With over 800 islands one of mainland Asia’s largest archipelagos, it had been completely off-limits to foreigners for almost 50 years. And now, heading northwest, we were cruising into its azure waters." "Choose an island and anchor the yacht. Trek through tropical forest, kayak through mangroves or just soak up the sun on the beach." "Myanmar is certainly on a rapid rise as a tourist destination, but still only very few people know about the country’s beautiful islands in the Andaman sea. Yacht company Burma Boating is operating a luxury sailing trip around the Mergui archipelago, offering vacation makers the chance to set foot on some of the 800 small islands that most people have never even heard of." "No cities, no hotels, no container vessels. The islands are covered by jungle stretching all the way to the beach and there's not a single footprint to be seen in the sand." "Film Contest: Young Eyes Movie Challenge. Burma Boating is calling on promising young filmmakers to make a creative sailing video. Winner gets a cash prize and sponsored yacht trip." "Sailing is a great lifestyle. It's natural and you can reach places that cannot be visited by other travellers." 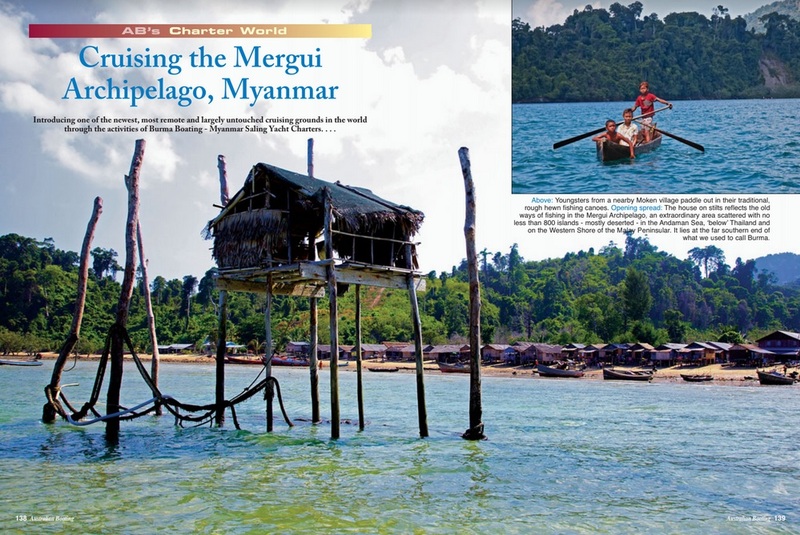 "The 800 islands of Myanmar’s Mergui archipelago are rarely visited and almost completely undeveloped. Now, as the country opens up, they could become the next frontier for Asian tourism." "The rest of our stay was dominated by the water and beaches that most people travel all this way for. We stopped by a seahorse-shaped island that forms the core of Lampi Island Marine National Park, Myanmar’s first and only marine park. It’s covered with thick forests of old-growth mangroves and is surrounded by clear, shallow waters. Sandbars give the illusion that you can stand on the surface of the ocean a half-mile out from land."